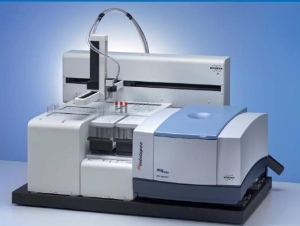 At Pittcon 2014 Bruker announced a new sample automation system for the minispec mq and mq-one series, a new easy to use and cost-effective system that brings sample automation to routine time-domain (TD)-NMR applications. Its fast sample exchange of 10mm OD sample tubes delivers new levels of maximum throughput and thanks to automated and precise tempering times measurement reliability is improved, significantly boosting productivity of the minispec series. Complex solid fat content (SFC) analysis, one of the major minispec applications, now benefits from highly accurate sample temperatures, delivering results in strictest accordance with SFC International Standard Methods. The minispec sample automation system is available as a standalone accessory to existing minispec systems from the mq and mq-one series, or as a packaged system with a new minispec spectrometer. The sample automation setup includes an x-y-z sample changer mounted on a robust platform that holds the minispec system, racks, tempering devices and balance securely in one place, ensuring conformity with European, American and Canadian regulations. An optional safety barrier incorporates sliding doors with locks and an emergency stop button. Fast, convenient sample insertion is facilitated by detection sensors on both input and output racks that clearly display tray status. Based on Peltier technology, the heating or cooling of samples is highly accurate, providing SFC tempering precision to ±0.1°C across a temperature range of 0°C-100°C. "The sample automation for minispec will immediately lift all new and existing SFC minispec customers to a significantly higher level of efficiency in their daily work," said Harald Todt, product manager for minispec at Bruker BioSpin.